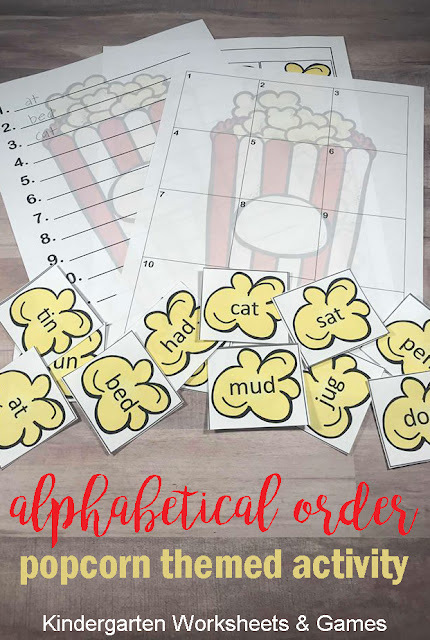 Make practicing alphabetical order fun with this free Popcorn Alphabetical Order Activity for Kindergarten, first grade, and 2nd grade kids. My daughter only has homework a few nights a week but when it’s a homework night we always pop some popcorn. I’m not sure why, but it makes it more exciting for both of us. Her homework the other night was a simple worksheet asking her to put a few words in alphabetical order. She loved it so much she actually said she wished that she could do more. 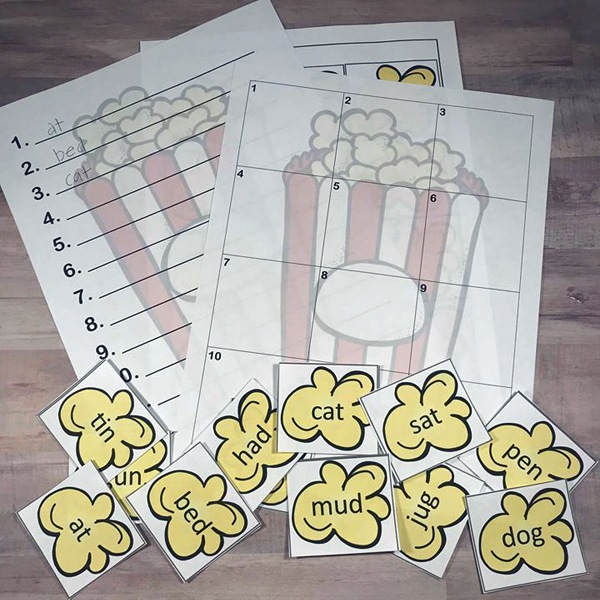 Que Popcorn Themed Alphabetical Order Activity. This activity would be perfect for centers or morning work. 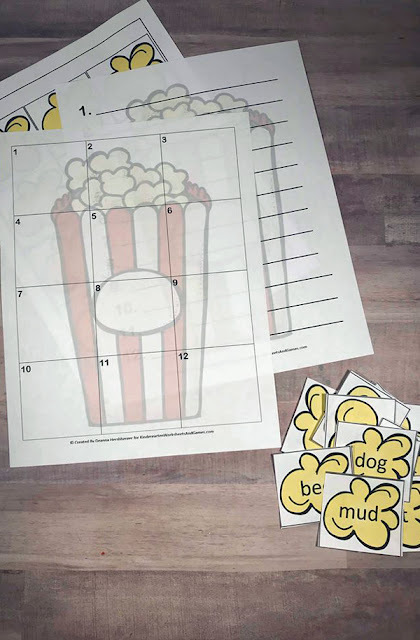 The popcorn theme is fun and this hands on activity will help with a variety of different areas. 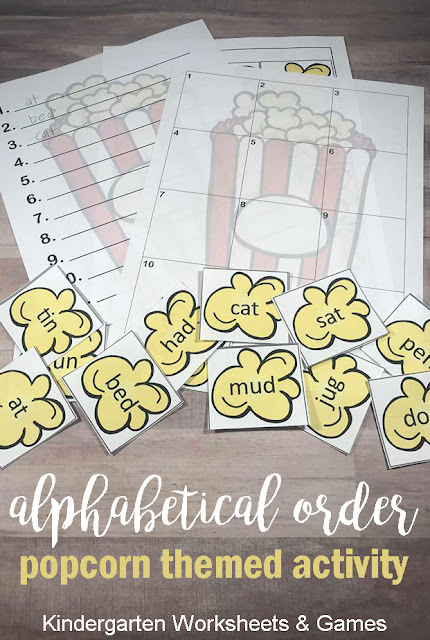 Print these Popcorn Alphabetical Order Activity on cardstock for using at home or laminate for durability if you are using this for centers or morning work to use with dry erase markers instead of pencils. We didn’t laminate it because my daughter wanted to use glue. We started off by cutting out the popcorn pieces with the sight words on it. I used simple CVC words so that she could practice reading and sounding out without becoming too overwhelmed. I chose this since the main point of the activity is alphabetical order not sight words. But there is never a wrong time to practice sounding out words! After we cut the words out, we put them in a line. The second page was needed now. This has a grid with each block numbered. Kids can put the words in alphabetical order and place them on the correct grid box. 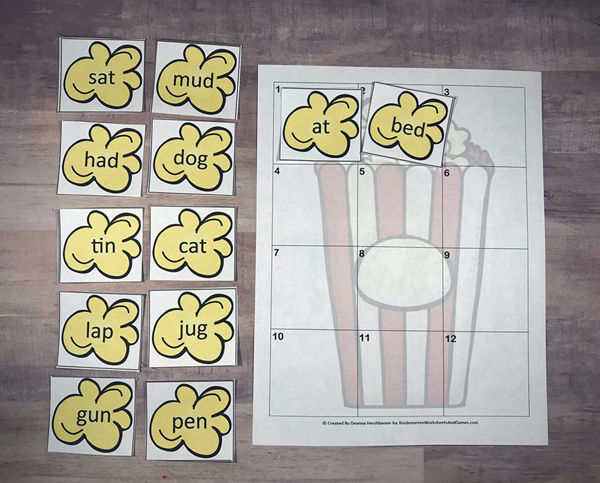 If you are using as homework or a one time activity kids can glue the words onto the grid. 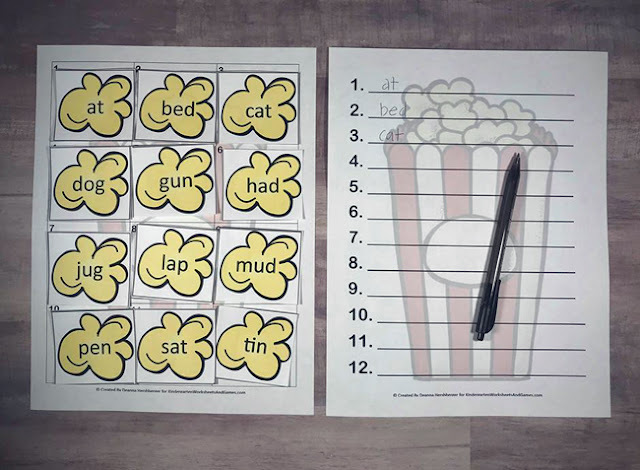 If you are laminating the words can just be placed on the grid or velcro dots could be used to make them stay put. After all of the words are put onto the grid in alphabetical order I had her pull out page 3. This is where she could write the words in alphabetical order. You could also have the child write the words right after it is put on the grid. Although I chose 12 CVC words, I also created blank popcorn kernels. This way you can use different CVC words or words at a higher reading level. This could also be done with plain ABCs. The blank pieces are on the last page of the packet. I like this activity because it not only helps reiterate ABCs but it also helps children sort by alphabetical order. Kids can also sound out words which is great for practicing letter sounds. The theme was perfect to match up with our homework snack but is also great if you are having a movie day at school, want an evergreen theme, or just because you like popcorn. Deanna Hershberger is a work at home mom, coffee obsessed, a diy addict and a Netflix binger. She spends her days playing and making with her daughter and enjoys quiet nights at home with her husband. She shares all of this on her blog Play Dough & Popsicles.